“Visiting the St. Nicholas Church in Leipzig was an incredibly moving experience for many in the group – it took us a bit by surprise, since we had been so focused on Luther that we hadn’t connected the dots until we were really there – having already been in Berlin to see the wall and take in the History Museum helped to make for a greater impact. Erfurt was absolutely charming, and the hotel location was perfect for exploring the city center on our own. My son and I loved visiting the Berliner Dom on our own and would encourage future groups (able to tackle the many stairs) to pay the 7 euro admission for the self-guided tour. The view of the city is spectacular, and the crypt was very interesting also! 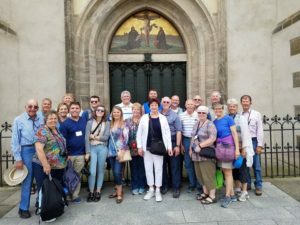 Our group seemed to really appreciate learning a simple German table prayer that we said together each evening – we also made some use of Luther’s Morning and Evening Prayers and German Lord’s Prayer and sang together a few times on the bus.